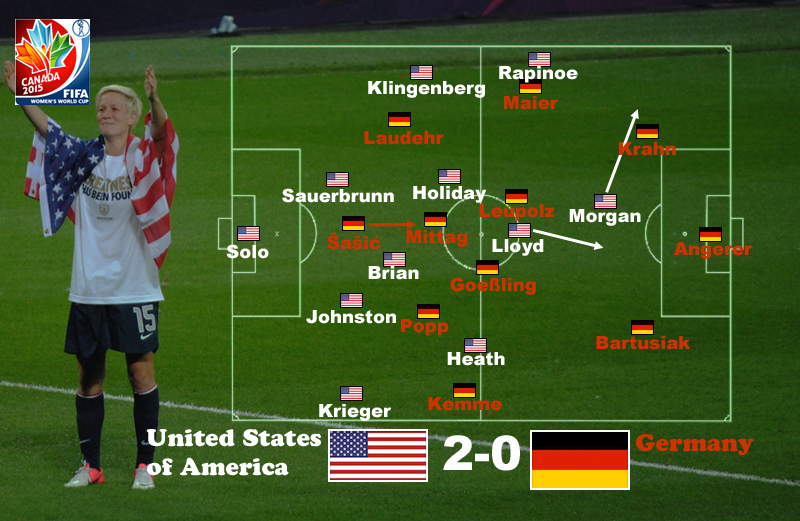 The United States clearly outperformed Germany, but won the game through poor refereeing and excellent diving. After weathering a brief spell of German pressure at the beginning of the match, the United States dominated the first half without scoring. The opening 15′ of the second half were very evenly balanced, but eventually the US regained an edge for the remainder of the game. None of that had much influence on the final score, but it was still the best US performance of the tournament and a very strong way to enter the finals. Jill Ellis again deserves credit for making shrewd tactical changes, though it must be said that the critical change in this game, moving Carli Lloyd forward and shifting to a single striker up top, are changes that others have been advocating for some time. Be that as it may, Lloyd turned in by far her best performance of the tournament when freed of defensive responsibilities. With Morgan Brian and Lauren Holiday in charge of controlling the midfield and efficiently distributing the ball, Lloyd could effectively serve as a second, deep-lying striker, which is where she has shined previously. Contrary to virtually all media reports, Lloyd has had a decidedly mixed tournament, but her performance against Germany merited the praise she had already been receiving. With the Carli Lloyd problem solved, Ellis will now have to decide what to do with the Alex Morgan problem. As she demonstrated against Germany, Morgan is now fit enough to create the chances one would expect of a world-class striker. Her 14′ run onto Tobin Heath’s brilliant pass shows why she must lead the US line. Of course, Morgan was unable to capitalize on that golden opportunity, and therein lies the problem. While Morgan is creating world-class chances, she is not, as yet, finishing them. The comical “finish” following her 43′ schooling of Annike Krahn (whom she had the better of all game) shows how far she is from top form. Where she needed to take the shot on with her right to counteract the spin, she instead tries to side foot it with her left past Nadine Angerer. She got it past her, alright. The good news–and the reason that Morgan’s inclusion in the side won’t really a problem for Ellis–is that her diving is not rusty at all. Since I was a bit glib in my discussion of Morgan’s dive in the Colombia game, I should be clear that what she is doing is not pretending something happened that didn’t but instead ensuring that the referee must make a decision about something that has, in fact, happened. Some people feel strongly that these are two separate things and that one of them is fine (let’s call it “gamesmanship”) while the other is something we need to get out of the game. If that distinction helps you feel good about rooting for Alex Morgan, don’t let me stop you. Personally, I’m happy rooting for her wonderful dives. But I hope we can all agree that, whatever we call it, Morgan’s attempt to play an impromptu game of piggyback with Krahn was a thing of beauty. Notice how Morgan pushes the ball left before diving right into Krahn. Now, there’s no doubt Krahn’s intention was to obstruct Morgan’s run, but it’s far from clear that she actually could have done so without Morgan’s help, and virtually impossible that Morgan would have ended up on Krahn’s back without the very creative thinking on display here. With the penalty against Colombia’s Sandra Sepúlveda, Morgan was able to ensure contact while leaving her foot in a natural position. So is that where we should draw the line between gamesmanship and diving? If not, imagine an alternate world (we can call it Arjenworld or the Garethverse) in which Krahn managed to pull out of her run and left Morgan throwing herself into thin air. Would that count as a dive? My point isn’t about the answer so much as to note the slipperiness of the slope we’re now treading on. Of course, Morgan’s piggyback ride might have counted for less without the incorrect awarding of a penalty by referee Teodora Alban. More conspiratorial thinkers–like England coach Mark Sampson–might be inclined to note how consistently the big calls in this game favored the side who had already been given an unfairly favorable seeding in the competition. In addition to awarding a penalty for this foul just outside the box, Alban allowed Julie Johnston to stay on the pitch after she pulled Alexandra Popp down in the box (not, it must be said, a very strong pull) and did not penalize Hope Solo for her penalty water-break shenanigans. But while I am loath to declare any wrongdoing beyond the reach of FIFA’s tentacles of evil, Alban’s night was almost certainly an instance of human error rather than malice. If she was trying to tip the game toward the United States, choosing not to award Germany their deserved penalty would have been a much more direct path–nor would that decision have been out of keeping with the general level of refereeing in tournament. If the fact that the United States was clearly the better team on the night does not put your conscience at ease, consider that Germany did not even deserve to reach the semifinals given their performance against France. In the finals, they will face a Japan side who did not really win (though in fairness neither did they lose) their semifinal game against an England side whom some might argue did not deserve their third-place win against Germany. Much like life, football offers more noise than signal. What we pattern-seeking humans choose to do with the results is a tricky business. With the probable exception of France, the two best teams in the tournament are likely contesting the final game. Germany looked up to their ranking in the group stages, but their performances against top sides proved them flat-track bullies (though it is worth noting that Germany played the entire tournament without FIFA Player of the Year Nadine Keßler, and against France and the United States with Dzenifer Marozsán injured). If the 2011 World Cup and 2012 Olympics finals offer a good measure, tonight should prove an exciting game between two very different but equally capable sides. As I have spent a significant amount of time minimizing the US achievement against Germany, I will close with one last vine of their second goal. It was scored the right way, and I will be rooting for more of the same tonight. UPDATE (6 February 2016): My recap of the United States – Japan final.